I feel like it was just Easter . . . and then I blinked and four weeks flew by! April was pretty crazy around these parts. The day after Easter, my MIL had a hip replacement. Fortunately, it went well, though getting back to “normal” has taken a bit longer than she expected/hoped. She is both Gabriel’s main caregiver (when he’s not at preschool), as well as Matthew’s main gardening partner-in-crime, so we really noticed her absence. Matthew was really busy work-wise the first half of the month. No sooner did things settle down for him than MY work kicked into high gear. As a result, my meditation practice started to fall by the wayside (just when I needed it the most, of course). But there’s light at the end of the tunnel! And into May . . . The first few days of May are giving April a run for their money. 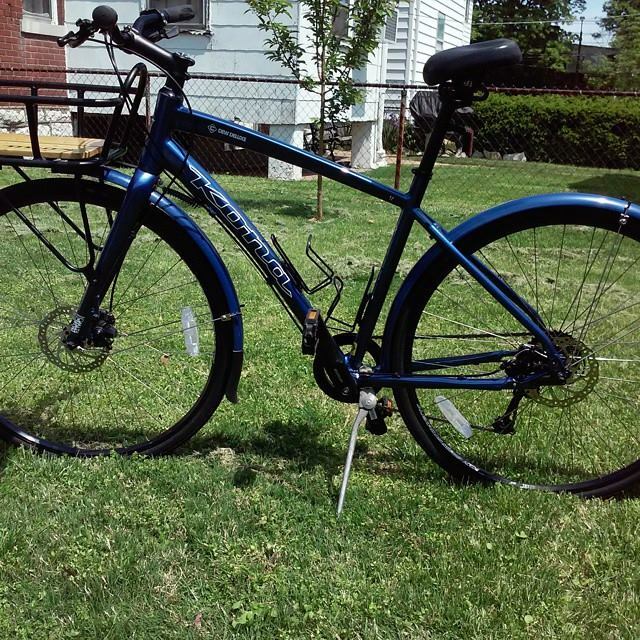 On Friday, my eight-month-long bike hunt [kind-of] ended when I purchased a Kona Dew Deluxe. Saturday was a catch-up day. A bit of phone learning and bike tinkering, though not quite what I’d hoped, because the rear rack from my previous bike didn’t quite fit on the newbie. We ventured out early Sunday morning for a bike-by of a property that had an open house later in the day. We confirmed that we did, indeed, want to make it to the open house that afternoon. The trip was extra productive because the route we took on our bikes led to the discovery of 4-5 more letter-worthy properties (that we wouldn’t have found by car). In the afternoon, we went back for the open house, and decided we wanted to make an offer. And then things got crazy. We seem to attract seller’s agents who like using the “give us your highest and best offer by X date and time” technique. Matthew took the day off work to be with Gabriel (another diagnosis of pneumonia, I’m afraid), while I dealt with the house stuff. Our offer is submitted (one of at least three offers they received), so now it’s just a waiting game. I’m enjoying finally having a bit of space to breathe, especially because it might be temporary. This entry was posted in Biking, Health, My Life and tagged house hunting. Bookmark the permalink.